Summer can bring the best and the worst of weather, as everyone in hurricane, tornado or flood-prone regions can attest. The key to riding out a big storm is being prepared, and today’s Grommet is a smart addition to your emergency preparedness kit. It’s also a fun one. Etón Corporation’s rugged radios can be charged by hand crank or solar power, so you have multiple ways to stay connected if the electricity goes out. Along with a radio, these compact devices include a flashlight and cell phone charger. 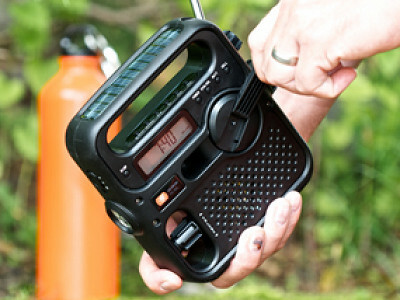 The Etón Microlink FR160 has an AM/FM and NOAA weatherband radio and a built-in 3-light LED flashlight. The Etón Solarlink FR360 offers the same radio band options, plus it adds a digital tuner, a more powerful flashlight, and the option to use conventional AAA batteries. 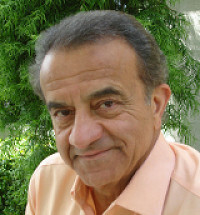 Etón founder Esmail Amid-Hozour, who brought the technology to the U.S. from Germany, has a long history of working with the American Red Cross and donating radios to victims of natural disasters around the world. But there’s no need to wait for an emergency to give Etón’s radios a try. They’re also great for connecting to your favorite station when you’re digging in the garden, relaxing at a campsite, or headed to the beach. Etón plugs you in... even when there are no plugs to be found. hanging out on the top of a mountain and being able to hear your favorite tunes? Looks like a great product. One question - how much cranking is required to charge the battery - let's say from dead to fully charged? If it takes a lot to charge, I guess one could look at it as an exercise aid as well. The solar power sounds appealing, but in case of a storm, that is probably not a good option. @Dave R: That's a very good question. Our crank feature generates about 10-15 minutes of radio play time (at a moderate to low volume) for ever 2 minutes of cranking. It's great exercise and helps keep you powered up for any outdoor adventure or power outage. Can you keep it charged with the solar power all the time? Does it require special batteries for the solar power? What is the life of the batteries? @Jane: Bonnie is at a meeting right now but she will be back to let you know. Thanks! @Jane: Hi Jane! For both the MICROLINK FR160 and SOLARLINK FR360, the re-chargeable batteries can be charged with solar power at all times when there is sun light available. In direct sunlight, the MICROLINK FR160 solar panel fully recharges the battery in about 8-10 hours, while the SOLARLINK FR360 solar panel recharges its battery in about 10 hours. A re-chargeable Ni-MH battery is included for both models. So need to worry about getting special batteries. do both models have the usb cell phone charger? @mal: Yes, they both have the USB cell phone charger capability. I'm committed to buying American this Christmas season. Where is this made? Summer can bring the best and the worst of weather, as everyone in hurricane, tornado or flood-prone regions can attest. The key to riding out a big storm is being prepared, and today’s Grommet is a smart addition to your emergency preparedness kit. It’s also a fun one. Etón Corporation’s rugged radios can be charged by hand crank or solar power, so you have multiple ways to stay connected if the electricity goes out. Along with a radio, these compact devices include a flashlight and cell phone charger. 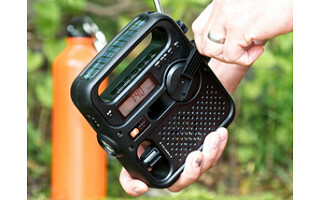 The Etón Microlink FR160 has an AM/FM and NOAA weatherband radio and a built-in 3-light LED flashlight. The Etón Solarlink FR360 offers the same radio band options, plus it adds a digital tuner, a more powerful flashlight, and the option to use conventional AAA batteries. Etón founder Esmail Amid-Hozour, who brought the technology to the U.S. from Germany, has a long history of working with the American Red Cross and donating radios to victims of natural disasters around the world.